How to SHIFT Your Cranky Mood – Fast! For this week’s article, an ‘Ask Christina’ question from my website. Love your new photos — beautiful and very professional! I’ve been imbibing the Abraham-Hicks workshop pod casts and so grateful to you for pointing me in that direction. I’m curious about something and wondering if you could share your thoughts on the blog or in an article. You mentioned in one of your blog posts that you tend to wake up cranky, and I am the same! I can go to sleep totally in the vortex and yet, every morning, I wake up grumpy and cantankerous. 1) Do you have any thoughts on why this is — what is happening while I am sleeping that I get thrown out of the vortex? 2) Once I am up and about, I listen to one of the ‘rampages’ that helps me raise my vibrational tone. But while I am lying in bed groggy and grumpy, that is too much of a leap. Do you have a short script that I can say to myself even before I get up? Thanks for the compliments on the photos and for your great question Renita. Geez, have I really told you folks that I am grumpy in the morning (I really need to cut down on the amount of self disclosure in my posts eh!). Well, it is a true tendency of mine (at least it used to be). When I was 10, my parents and brother set up a rule not to talk to me until after 10am in the fall and winter months … and now, for the most part, I don’t start my ‘real’ work until after 10am cause I really like to protect that precious morning time. Why do you get thrown out of the vortex during sleep? Well, while it looks like this is connected to sleep, it probably isn’t. There is most likely a bigger issue going on and/or it’s just a symptom of your particular manifestation style. Each morning we return to our regular vibrational state – kind of like a reset button or rubber band. We return to where we naturally vibrate (for those of you new to Law of Attraction (LOA) speak – this means your emotional set point). If you are generally happy and satisfied with your life, you will wake up in an emotional and vibrational zone that matches that. If however, you aren’t particularly happy or satisfied, you will wake up in an emotional and vibrational state that matches that. Like me as a kid in the summer – woke up instantly happy and bounded out the door to play with my friends. But crabby in fall and winter months … cause the freedom loving being that I was resented having to do what others wanted me to do all day. As for your particular manifestation style – it could be a lot like my own. If you are a person who is very focused on growth and development … you could be operating in a constant state of striving that has developed an ‘edge’ to it that you will notice more distinctly in the mornings (when there is less to cover up the tone of your vibrational state). It will be important to learn to soothe this edge – which is something a lot of high achievers have to deal with. They get so focused on the future and what they still want or on perfection and self-imposed standards … that they can lose sight of what they do have, have accomplished and how good things are. Its important to get ‘in the now’ and enjoy it instead of always striving after goals and what is next. 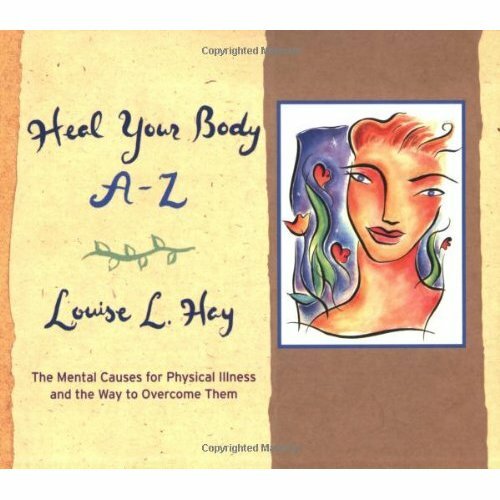 As for a script in the morning … Louise Hay has a lovely affirmation in the back of her famous little book called Heal Your Body (the mental causes for physical illness and the metaphysical way to overcome them). I read this script upon waking for years –starting back when I first launched my own business in San Francisco. She calls it ‘Loving Treatment’. Now, because you have mentioned Abraham, I am also going to give you Abraham-Hicks’ step-by-step evening and morning routine to shift your vibe. Step 1: Before going to sleep, nestle into your bed and focus on your immediate surroundings – the warmth and shelter of your bed. The nice smell of your sheets. The weight of the blankets upon you. The way the mattress supports you. 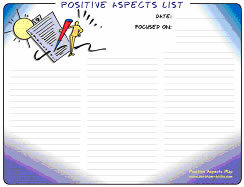 Then, in your mind … be a selective sifter and focus on all of the positive things that happened in the day that you just had. Even if there are only a few, focus on those few and milk them for good feelings! Drift off to sleep focusing on those nice feeling things. (Click Here for full Positive Aspects directions and one my handy visual maps). Step 2: Immediately upon waking, repeat what you did before falling asleep – focus on the warmth of your bed, the smell of your sheets (if they smell nice! ), the weight of your blanket. Perhaps the sounds of the birds or the sight of the sunshine poking through your blinds. Then review the nice feeling positive aspects from yesterday. Then contemplate the nice feeling things that you expect to encounter in the day ahead of you (this is called pre-paving). Step 3: Get out of bed and do whatever your normal morning routine is (brush your teeth, shower, get dressed, eat your breakfast, etc.). Then, take a few minutes to do a couple of Focus Wheels. 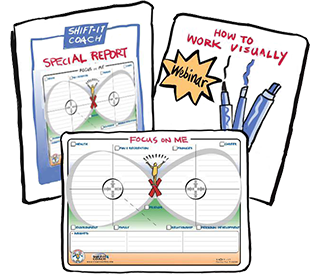 The Focus Wheel is a powerful exercise that makes you focus in a way that is productive. You do them on things that you don’t feel particularly good about, in order to stretch your thinking and feeling into better feeling states. Again, I have done a full explanation on this powerful process previously and have a visual map that you can use – Click Here to access those directions and another visual map. Step 4: You mention Abraham’s rampages in your note – so I know you know what they are. Yes, you are absolutely right – they are very difficult to do cold turkey like you have been trying to do. Like in physical exercise, you need to ‘warm yourself up’ when you are doing Law of Attraction work. Do Steps 1-3 that I have outlined above, then you are ready to progress to Rampages of Appreciations (here is an 11 minute Abraham audio rampage) … or rampage away yourself on all of things you are delighted about for a few moments. Hopefully I have done a good job of empowering you with resources that will assist you in shifting your vibe effectively in the morning. If you would like more assistance on these and additional LOA processes check out my private coaching options (both in-person and distance sessions available … all in my trademark visual style). Also SHIFT-IT Online (online class offered twice a year) incorporates Law of Attraction techniques into business and life coaching. SHIFT-IT is also available via a Home Study Kit, so you can do your own visioning and planning using Law of Attraction techniques (and visuals!) 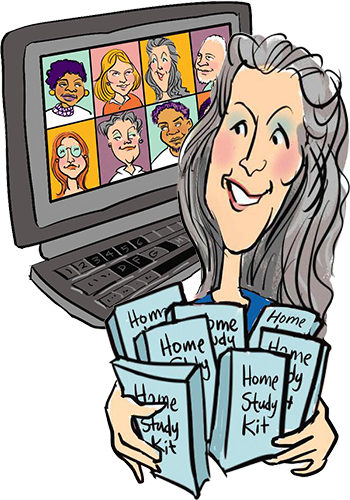 from the comfort of your own home working at your own pace. Well, there you have it Renita – I think I have thoroughly answered your question and I hope that you have good results with putting these processes into practice. Remember, practice does make perfect with this stuff! Thanks so much for your great questions! I was really interested to listen to your reply to Renita’s question. I Have been involved with Louise Hays work for over 20yrs….. Do you know I have the little book beside my bed and during the last 6 months it has hardly left myside due to a whole lot of ‘stuff’ that has been going on for me. It is my BIBLE !